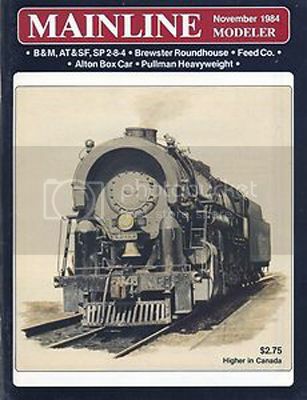 If I could have one thing that would increase my enjoyment of the hobby, it would be the complete collection of Mainline Modeler magazine on DVD – just like the 75 Years of Model Railroader and the 70 Years of Trains Magazine DVDs. This entry was posted in resources by Trevor. Bookmark the permalink. Another option would be to add it to the stable of magazines hosted at TrainLife. And since we are in the topic of TrainLife, I wouldn’t mind seeing Railroad Modeler (Challenge Publications who published a number Modeler titles) hosted there as well. While a distant third to the two heavyweights of the model railroading press (MR and RMC) there was a unique perspective that was refreshing. Agreed. TrainLife would be far better than having the knowledge disappear. Obviously, Bob Hundman would have to agree. But once he did, I bet an army of volunteers would get the issues scanned in short order. It would be a fitting legacy to the hobby. I have a complete set of Mainline Modeler and plan to keep them. While I primarily model narrow gauge, it is a great reference tool full of modeling tips. A pdf collection of Mainline Modeler would be great (of course, a pdf collection of MR I could load on my iPad would also be great). In the interest of adding to the list, it’s worth noting that nearly a decade of Model Railroading magazine is also available on pdf. Thanks for mentioning Model Railroading magazine. Good addition to the discussion. I purchased that collection and it’s very nice to have. That’s right, Arthur. Mainline Modeler ceased publication several years ago.